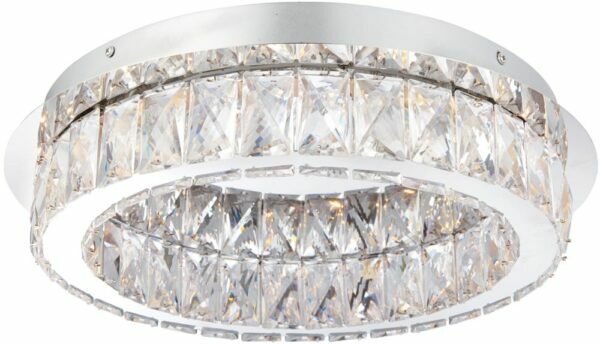 This Swayze flush chrome finish 16w LED light with clear faceted drops is stylish, contemporary and energy efficient. With a chrome effect flush mount and outer frame decorated with two rows of faceted clear acrylic drops that will sparkle and refract the light when illuminated. The acrylic is impregnated with a substance that makes it react like crystal but at a fraction of the cost. This fitting has 16w of warm white (3000k) led ribbon installed between the faceted prisms that shines down between the layers to create an extraordinary effect. The non-dimmable, non-replaceable LED strips give a total lighting output of 1280 lumen. Perfect lighting for any room with limited ceiling height. A class 2 double insulated ceiling light, no earth required. There are matching products in this range that can be viewed below.